Today, Intel is recognizing 35 suppliers for their exceptional commitment to quality in 2018. These suppliers have collaborated with Intel to implement innovative process improvements and serve with the highest level of integrity, while providing superior products and services. Intel has three levels of supplier recognition: the Supplier Continuous Quality Improvement (SCQI) award, the Preferred Quality Supplier (PQS) award and the Supplier Achievement Award (SAA). The awards are part of Intel’s SCQI program, which encourages Intel’s key suppliers to strive for best-in-class levels of excellence and continuous improvement. Through the SCQI program, Intel also recognizes supplier achievements in diversity leadership, innovation and world-class safety program performance. Learn more about quality expectations of Intel suppliers. The SCQI award is Intel’s most prestigious recognition and signifies an elite performance in all critical management systems supporting quality, cost, availability, technology, customer service and sustainability. These suppliers are industry role-models and provide unparalleled supply chain support. The PQS award recognizes suppliers who relentlessly pursue excellence and conduct business with resolute professionalism. To qualify for PQS status, suppliers must exceed high expectations and uncompromising performance goals while scoring at least 80 percent on an integrated report card that assesses performance throughout the year. Suppliers must also achieve 80 percent or greater on a challenging continuous improvement plan and demonstrate solid quality and business systems. 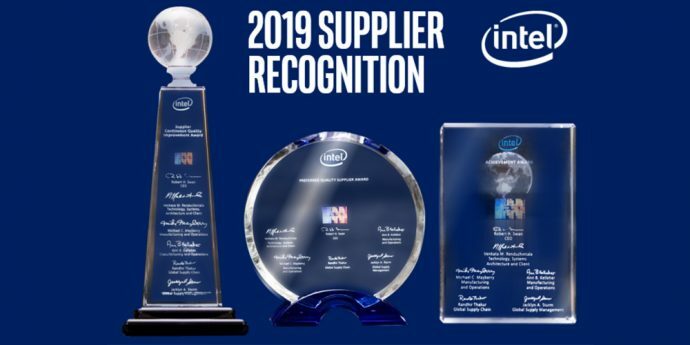 Eight companies were honored with Intel’s 2018 Supplier Achievement Award for specific recognition in one performance area. These companies provided outstanding contributions leading to a significant improvement for Intel business. Collaboration is at the core of any successful supply chain. The 2018 SCQI, PQS and SAA winners provide exceptional collaboration contributing to Intel’s success.